Caribbean reefs have experienced widespread declines in recent decades, shifting towards low coral cover, high algal populations, reduced reef structure, and suppressed fish populations. Bonaire, however, is one of the best exceptions to this regional trend. While its southern location protects reefs by putting them outside of the major Caribbean hurricane belt, reef health can also be attributed to dedicated management efforts that date back to the 1960s. Whereas spearfishing and specifically the harvest of herbivorous fish have degraded reef ecosystems across the Caribbean, Bonaire has prohibited spearfishing and all harvest of parrotfish since the 1970s. Its well-protected reefs have generated one of the most successful dive tourism industries in the region, which continues to fuel management incentives. In 2003, Bonaire contracted a group of researchers from the University of Maine to implement a long term monitoring program on Bonaire’s reefs. I have been involved in this monitoring program since 2015, leading the herbivorous fish and reef rugosity assessments and co-editing the 2017 Bonaire Report. 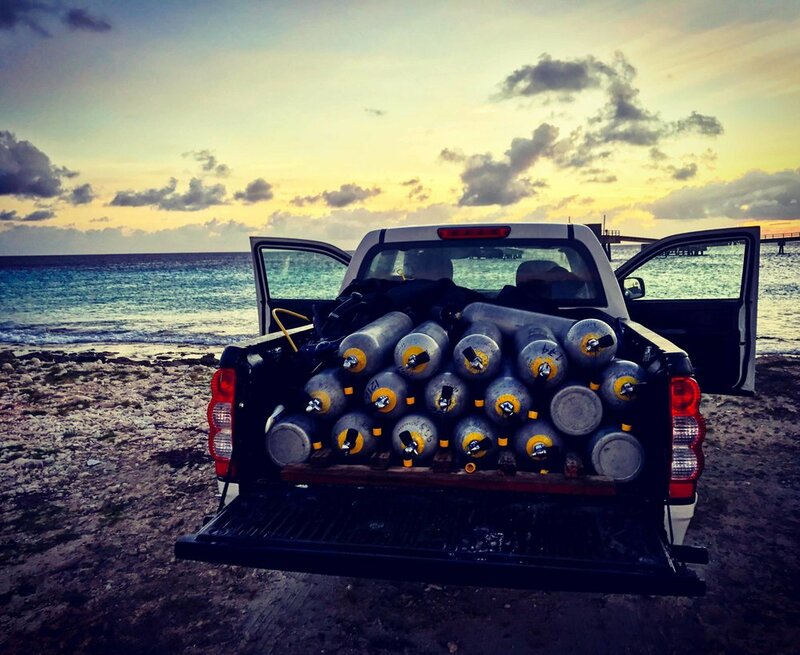 The goal of these biennial surveys is to monitor and document the effectiveness of Bonaire’s reef management, as well as identify any potential threats to reef health. In 2010, unusually warm water temperatures triggered a widespread coral bleaching event that killed 10% of live corals and led to a spike in algal abundance. Divers, managers, and community members were deeply concerned about whether or not Bonaire’s reefs would be able to recover. Unlike in some of the more pristine and less nutrient-rich areas of the Pacific, effective recovery from coral bleaching had yet to be documented in the Caribbean. However, in the years since the 2010 bleaching event, our biennial surveys have shown steady increases in live coral cover and consistent declines in algal abundance, with some interesting corresponding trends in herbivorous fish populations. We are using this long term dataset to better understand the factors that facilitate recovery from coral bleaching in the Caribbean, investigating Bonaire’s reefs as a bright spot among many less promising stories across the Caribbean. Steneck, R. and M. Wilson (Eds.). 2017. Status and Trends of Bonaire’s Coral Reefs in 2017. University of Maine. Wilson, M. 2015. Architectural Complexity of Bonaire’s Coral Reefs. In R. Steneck et. al (Eds. ), Status and Trends of Bonaire’s Coral Reefs in 2015. University of Maine: 66-71.